Over the weekend a friend and I left the bubble and headed over to "Hip-silanti." That's what my friend Nano used to call Ann Arbor's neighbor to the east (which, by the way, was named in the 1820s after Greek war hero Demetrius Ypsilanti.). We were headed to check out the new Mix Marketplace, a food and artisan market downtown at Michigan and Washington. Our little junket seemed especially relevant because this week Feb. 27 was supposed to be a national day of action to "Occupy the Food System," which Vandana Shiva, well-known Indian physicist, director of the Research Foundation on Science, Technology and Ecology, and founder of the Navdanya seed bank, describes as "simultaneously resisting corporate control and building sustainable and just alternatives, from the seed to the table. One seed at a time, one farm at a time, one meal at a time — we must break out of corporate food dictatorship and create a vibrant and robust food democracy." Even when high-flown language is used to describe the overall sentiment of working toward food democracy, it's the quirky, hometown, redemptive efforts of individuals that, in my opinion, will save us from the hell of generic corporate hegemony. Among the reasons it matters, according to Sustainable Business News: "Of the 40,000 food items in a typical U.S. grocery store, more than half are now brought to us by just 10 corporations... Today, three companies process more than 70 percent of all U.S. beef: Tyson, Cargill and JBS. More than 90 percent of soybean seeds and 80 percent of corn seeds used in the United States are sold by just one company: Monsanto. Four companies are responsible for up to 90 percent of the global trade in grain. And one in four food dollars is spent at Walmart." So in a country of millions of people, we are actually getting our food from very few places. And one in four of our food dollars is spent at the largest company in the U.S, which happens to be one that doesn't allow its 2.1 million workers to unionize and doesn't pay most them a living wage or offer them health care. And who do you think ends up paying for that? Wal-Mart has been called a "retail force that has yet to meet any immovable objects." That's why on Saturday it was was inspiring to see how just a few people have been able take matters into their own hands to create some of the change they want to see in Ypsilanti. 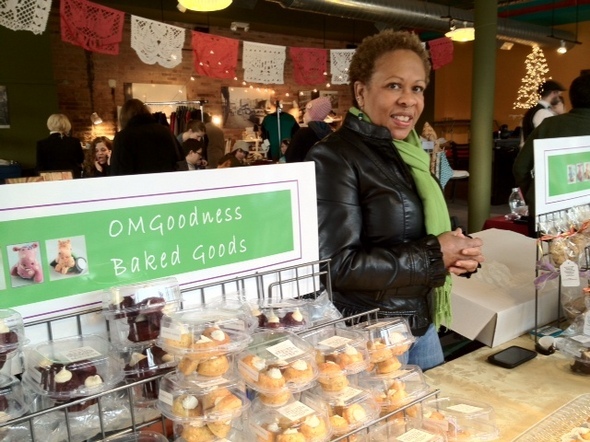 Mix Marketplace is fun, perhaps because OMGoodness owner Kim Hoppe was right at the door offering tastes of her miniature baked donuts (try the chai tea version). The website describes Mix Marketplace as a kind of indoor farmers market with "the wares and products of a collection of local entrepreneurs who offer a wide variety of artisan, gourmet, and locally produced foods, handmade goods, and vintage and antique merchandise." Volunteer market manger Laura Gillis says about 15-30 vendors show up weekly, all with "made in Michigan" products, selling everything from jam and cupcakes to beach glass jewelry and picture frames. It's eclectic — Ypsi's Ugly Mug is there with coffee, Bridgewater Barns with organic meat and eggs and Crank Call with antique telephones. Gillis says founders Bonnie and Ed Penet and Leslie and Markel Leland wanted to have an Ypsilanti marketplace that would help the downtown and also support new cottage food entrepreneurs. After starting out as a holiday bazaar last November and December, there are now plans afoot to turn Mix Marketplace into a permanent food hall. They're giving a home to a diverse community of permanent and temporary creatives, like the coral reef does for sea creatures, and that draws even trapped-in-the-bubble Ann Arbor-ites like Nancy Biehn (owner of Sweet Gem Confections, spied there) and me. Fans of the popular Bona Sera "secret supper club" will be happy to know that the Bona Sera gals (proprietors who have operated their charity fund-raising dinners under the personas of Bad Fairy and Wonder Woman) are using Mix Marketplace to go legit, holding down a strategic corner of the space and making plans to bring their porchetta to the people on a regular basis. They're already cooking out of a certified commercial kitchen and on Saturday they were serving delicious Shrimp Banh Mi sandwiches (with slices of cucumber and sprigs of cilantro), tamarind coolers and noodles with peanut sauce. They will have a permanent kitchen at Mix Marketplace and just bought their first two pieces of equipment. Bonnie Penet, co-founder of the Mix Marketplace, taught in Detroit for 18 years before starting a career as an artist. She says that she and her husband had volunteered on every board in Ypsilanti before getting fed up with the fighting and lack of forward motion. They quit the political action front and decided to go direct with the economic angle. Suddenly they're running the Mix|New and Used boutique (across the street from Mix Marketplace), renting part of their space to two theater companies and starting up a food hall and a wine bar. She told me they've made more difference by opening their stores and being downtown than they have on all the boards over the past 10 years. Penet says that the advantage of having worked so long with the city is that they have trusted relationships with people and have been able to work out mutually beneficial agreements because she and her husband are known to be "responsible adults" in a system where decision making can be fairly subjective. So to occupy the food system, it may be like Jerry Garcia waggishly observed, that, "Somebody has to do something, and it's just incredibly pathetic that it has to be us." Margaret Mead was much more eloquent about transformative change: "Never doubt that a small group of thoughtful, committed citizens can change the world. Indeed, it is the only thing that ever has." The last thing Bonnie Penet told me was "I'm 66 but I feel like 40 — I have so much energy, and I love the mentoring aspect of this." Her comment reminded me of something I read recently that advised: "Don't ask what the world needs. Ask what makes you come alive, and go do it. Because what the world needs is people who have come alive." People who are taking risks to start new food businesses and open new downtown community spaces look like people who have come alive to me. I'm planning to occupy Mix Marketplace to watch, learn, taste and appreciate how it can be done. I'm looking forward to that wine bar with my banh mi sandwich. Tuesday from 3-8 p.m. and Saturday from 11 a.m.-4 p.m. Sat, Mar 3, 2012 : 2:37 a.m. Wonderful article - beautifully written. When I visited the Mix I just loved the mix of creativity and fun. Even the art was &quot;delicious&quot;. Definitely worth the trip. Sat, Mar 3, 2012 : 1:39 a.m. Thanks so much for the great article...and yes the hours and days of MIX Marketplace ARE indeed changing! We've dropped Tuesdays, and kept Saturdays 11-4pm. Beginning on Friday, March 16th the new schedule will kick in: Fridays from 5pm-9pm, Saturday's from 12 noon to 5pm, and Sundays from 12noon - 5pm. Fri, Mar 2, 2012 : 3:11 a.m. I love the Mix! Just got a dozen fresh eggs last week. Great cute artistic shirt. Kim's Red Velvet cupcakes are so amazing! FUN Stuff, I hope they get more vendors, more local produce, meat, eggs, cheese. YES good stuff. Fri, Mar 2, 2012 : 1:02 a.m. If you haven't gone, you should. Mix Market is an amazing assortment of treasures. Bonnie and Leslie are business owners with a sense of purpose and pride in their fair city. I've been twice and need to make it one of my regular stops. If you are an Ann Arborite, it's worth the money in gas. When you go, be sure to check out their store too...it's wonderful. Thu, Mar 1, 2012 : 8:53 p.m. This is great. I was wondering how this was going. I'll have to stop on by! Thu, Mar 1, 2012 : 8:49 p.m.